For my recent manicure, I picked this very odd color, Essie Perky Purple. Perky Purple was introduced a long time ago as a part of one of those summer neon collections. I am not into neons at all. I never was. It is not a typical neon, and that's probably why I bought it in the first place. To me, Perky Purple is just a strikingly pretty thing that doesn't look neon nor purple. Only the bottle flashes a bit of purple, but the color itself is not so purple on my nails. My picture could be totally misleading cause it does look much purpler under bright sunlight, but it certainly is not one of those in-your-face neons. Indoors, it reads a dark cherry red with just a bit of pink/purple tinge that makes my skin look incredibly bright and clean against it. No matter what I do with the camera settings, it is a red under the neutral white lighting I use. Now I am even thinking my Perky Purple might have turned because I've had it for so long..? Have you had any similar experience with neon nail colors? I tried searching swatch pics on google only to find they were all over the place as well. This picture, however, is quite close to what it looks in real life before topcoat. 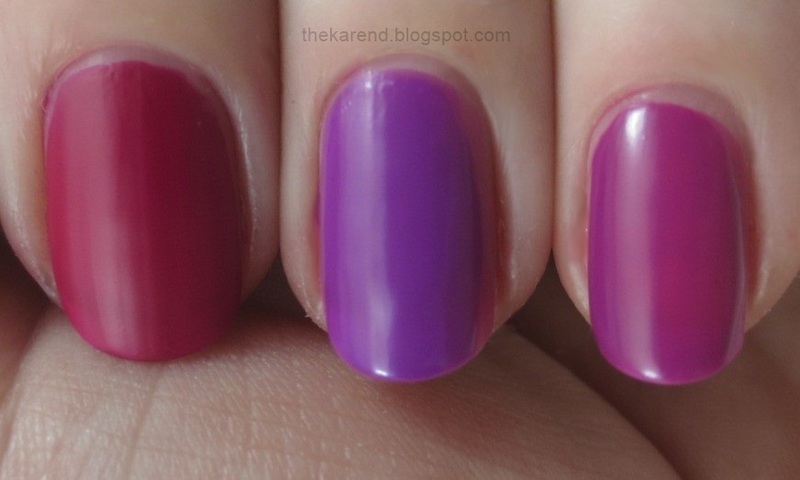 Perky Purple IS a neon color since it quickly dries to an ugly uneven matte finish. Unless you're into that look, you definitely need a nice glossy topcoat. Even with something like Seche Vite Fast Dry Top Coat (that adds glorious shine to any nail color), it tends to look dull after a few days. Maybe neon colors eat up top coat, too. I don't know. Despite of all that, and whether turned or not, Perky Purple still is an eye-catcher. Yesterday at work, I got a few compliments on my nail color from my colleagues. They all added "Oh, so you celebrate Chinese new years, too?" So I guess it looks red to other people's eyes as well. What a nice, unintended choice it was! Today is going to be another work day for me followed by regular weekend although I want to try this recipe of a traditional Korean food for New Year's day. After all, Perky Purple being not purple but red, is just an excuse. I guess I wanted to wish everyone a prosperous and healthy new year. Happy LUNAR New Year! Love your perky purple which is very very red to me! :) No plans for dduk guk for me, but I always enjoy on the 1st of January. Wait a minute, this ain't purple LOL That's a funny name for the shade! Happy lunar new year, Lena! I hope you're getting yummy noms for the occasion! I agree! I wear this very rarely but everytime I get surprised at how pretty it i! It looks gorgeous on you but it does look just regular red to me, lol. My family doesn't do lunar new year just because we do Jan 1st and don't have many relatives in Canada. I miss the large gatherings in Korea. I was thinking the same thing the other day, Claire! The nail color goes well with Dior Addict Extreme Black Tie, for example. LOL. Haha, interesting! That shade is definitely not a purple at all! 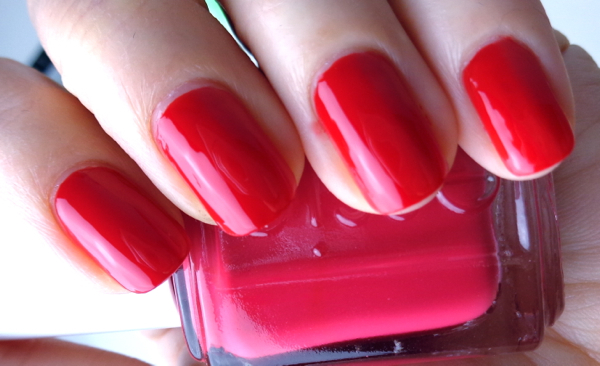 It is a lovely glossy red! Happy Lunar New Year to you and your family! Lol..whatever happened its a lovely shade! Looks amazing on ur nails ! 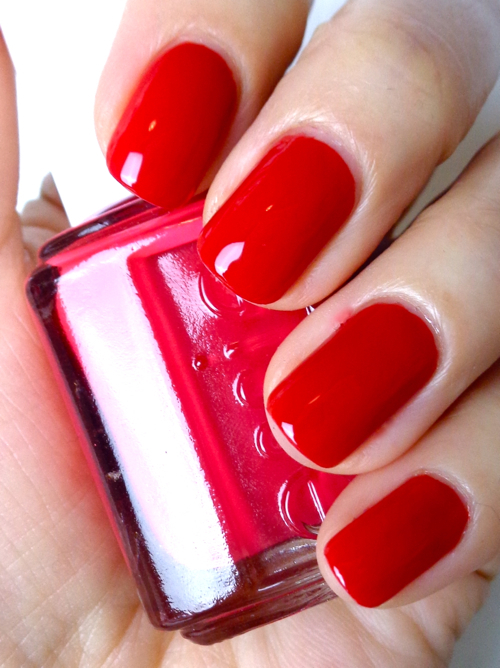 LOL at the name, they couldnt call it perky red i guess lol regardless, the color is Gorgeous! Happy Lunar New year Lena!! Wow this polish is such a gorgeous shade! I love Essie! You're right -- doesn't look purple at all. Perky Purple doesn't seem to be a very fitting name. Gorgeous and striking shade though. I have a bottle of Essie Perky Purple, and mine has turned ORANGE. I had swapped for it and I don't think it was as bright purple as it was supposed to be, but more of a pinkish-purple. Then the next time I had used it, it was slightly reddish pink with orange undertones. Now it's just orange! I haven't noticed it with any other neon colors I own; just this one is boggling my mind. Good to know that I haven't gone crazy or anything.